Carol Brown Goldberg was born in Baltimore, MD. She moved to the Washington, DC metro area after graduating from University of Maryland with a B.A. in American Studies. She received a second B.A. at the Corcoran School of Art, where she was awarded the Eugene M. Weisz award upon graduation. In 1989 and 1990, Goldberg produced and curated a 14-part lecture series, “Voices of Our Time,” which explored the relationship between art and science. This interest in science has also led her to serve as a board member of the Johns Hopkins Lyme Disease Research Center. She has taught at American University and University of Maryland, was Artist in Residence at Chautauqua Institute, is a recipient of the Maryland State Arts Award, serves on the board of The Phillips Collection in Washington, DC and serves on the Collector’s Committee of the Reading Public Museum and the Contemporary Art Accessions Committee of the Baltimore Museum of Art. She will honored by Moment Magazine in November of 2018 alongside Ruth Bader Ginsburg and Jane Mayer, as part of the ‘Year of the Woman’ Gala. In 2012 she was featured on the cover for Art Santa Fe. Also in 2012, she and neuro-scientist Partha Mitra discussed ‘Creativity and the Brain” on a panel led by artist Fre Ilgen in Berlin, Germany. The same year, she produced the award winning 11-minute film, The Color of Time. In 2013 she was awarded third prize for a sculpture installation scheduled for the Parque de Levante in Murcia, Spain. From 2014-2016 her paintings and sculpture were on a touring exhibition, which included the Vero Beach Museum of Art, the Foosaner Art Museum, South Dakota Art Museum, and Lake Charles Cultural Center. Other recent exhibition venues include The Frost Art Museum, The Phillips Collection, The American University Museum at the Katzen Arts Center and Washington County Museum of Fine Art. She has shown in the U.S. and internationally in hundreds of solo and group exhibitions, including solo traveling painting exhibits throughout Spain and Mexico. 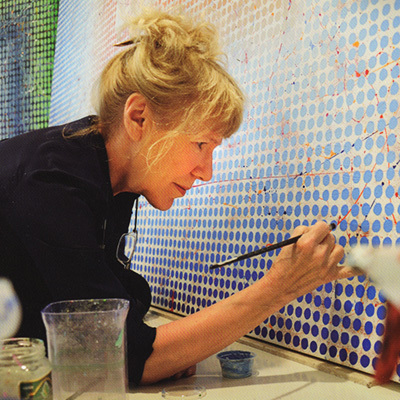 Her work is included in many museums and private collections, including New Orleans Museum of Art and National Museum for Women in the Arts, as well as permanent outdoor sculpture installations at Medina del Campo Sculpture Park in Spain, The Kreeger Museum, The Katzen Arts Center at American University, George Washington University, Montclair State University, Reading Public Museum, Chautauqua Institution, Johns Hopkins Hospital, and most recently at Martha’s Table in Washington, DC. She is represented by Addison/Ripley Fine Art in Washington, DC.